After reading Girl in the Kitchen a few months ago, I kept thinking back to a couple of recipes that appear in the Extras chapter at the end of the book. They’re similar concepts, and both are nut butters. One is a Miso-Marcona Almond Butter, and the other is a Pistachio-Cilantro Butter. Both include nuts, miso, soy sauce, honey, olive oil, and something spicy, and both are recommended as accompaniments to shrimp or scallops among other things. I knew mild scallops would be a good vehicle for either of these thick sauces with savory, nutty, spicy flavors full of umami. I decided to go with the pistachio version primarily because that one also includes cilantro, and I wanted to use the last of the cilantro from my garden now that its season has come to an end. There’s also sriracha in it, and when is that not a good thing? So, making the sauce is a simple matter of throwing several things into a food processor and pushing the on button. Those things are: shelled, salted pistachios, cilantro leaves, vegetable oil, olive oil, lemon zest, lemon juice, honey, soy sauce, Dijon mustard, sriracha, white miso, salt, and pepper. It forms a very thick paste, but you can thin it with water to the consistency you desire. The finished nut butter can be stored in the refrigerator for several weeks, but I found that it gets thicker as it sits. You may want to whisk in a little water if using after it has been stored. If you use the sauce right away, it’s at its glossy best. I placed the sauce on the plate and sat seared scallops on top since this isn’t a loose, drizzling kind of sauce. Also, Kurt has a thing about preferring sauces not to be on top of scallops as he enjoys the crispness from the searing, so sauce on the plate worked well for two reasons. I don’t think I ever would have come up with the combination of ingredients in this sauce, but I’m very glad to have tried it. The flavors are bright and rich with a nice kick considering that I added a little extra sriracha. There’s also a recipe in the book that uses this pistachio butter with Balsamic Barbecue Quail. I already know how good that will be, and I now know to make extra pistachio butter when I get to that recipe. Gorgeous! That is such a wonderful way of preparing scallops. So refined. This looks too beautiful to eat! I heard a Sriracha call, so here I am! 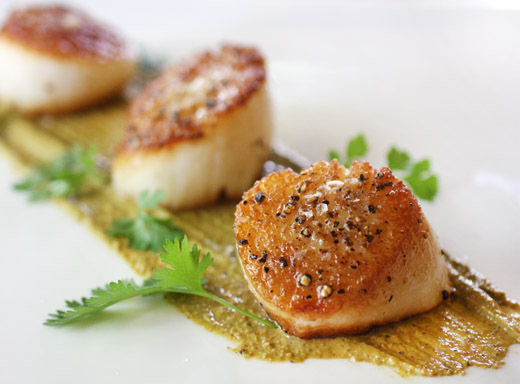 This recipe truly elevates the way scallops are presented. I am going to have to look for this recipe, it is really gorgeous. Funny that you mention cilantro season is ending in your part of the world, it is barely beginning here. Oh my...Lisa, you have such wonder hands. That looks like a piece of art, and the butter sounds beautiful. I would pay handsomely for such a dish! Bobbie: I don't actually re-print recipes from books without publisher's permission. That pistachio butter is really intriguing. I'm not crazy about cilantro, so always substitute parsley. I know there's a big flavor difference, but think it will work here. Oh, good food styling on pictures! Really good photos. And a nice looking dish, too. Great concept - it'll be fun to play with these ingredients in the kitchen. 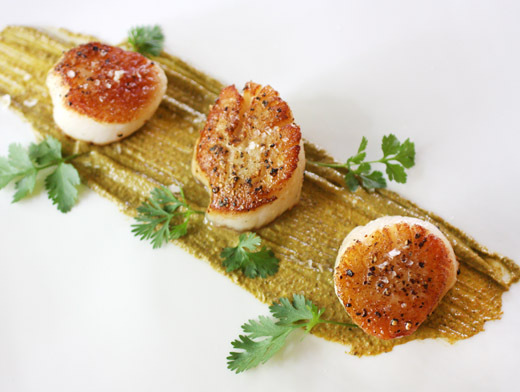 And scallops are my wife's favorite food, so I'm always looking for new ways to prepare them. Thanks for a great post! I love cooking scallops. They're so quick but sophisticated. Add a sauce and they're divine! You make the coolest dishes! Beautiful sear on those scallops! And that is a really intriguing combination of flavors- can't say I would have thought of mixing up sriracha and pistachio either. Glad it was a nice surprise! The scallops look so delectable! I am tempted to try the sauce, but won't add to much heat as to not over power the scrumptious scallops. A perfect weekend dinner! Lisa, this a fabulous photo of those scallops. I love it. 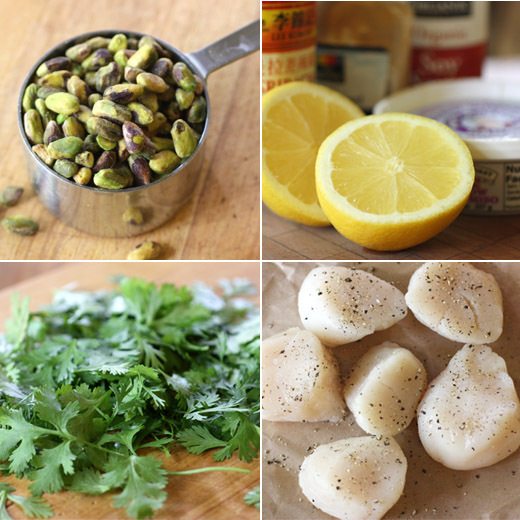 This is such an appropriate recipe for me, since I am surrounded by pistachios and cilantro now! Great clics, too! USE: I'm trying to imagine the sauce with salmon. It has so many layers of flavor, I actually think it might be better with something milder--a fish that's more of a blank canvas. It would be great with shrimp or grilled squid or maybe halibut. That's the first time hearing someone veto sauce on the scallop. It kind of makes sense though. Either way, the sauce gives you more flavor! wow what a gourmet creation! Beautiful presentation.